Brisbane’s underground bus and train project has been named the BaT (Bus and Train) Tunnel after an extensive competition, giving the winner, Capalaba’s Lynne Doyle six months of free travel. Premier Campbell Newman said the name for the once-in-a-generation project featuring a split level transport tunnel was chosen from almost 1,000 entries in the month-long competition. “We are delivering better infrastructure through better planning as we promised at the election, and today we are announcing the name and releasing the draft reference design,” Mr Newman said. “We are now getting down to the business end of the modelling and consultation for this project, to unlock the future of public transport through the heart of Brisbane. Treasurer Tim Nicholls said the draft reference design was now open for public feedback and included a new location for the George Street station and minor adjustments to the alignment. Mr Nicholls said six community information sessions would take place from 27 March to 9 April in and around Brisbane. Transport Minister Scott Emerson said the project was generating a lot of interest from industry and the community. 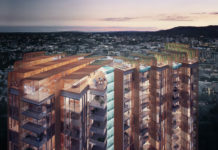 “This design now outlines the full scope of the project, including the location of a station at 63 George St to service QUT, Brisbane’s CBD and the Queen’s Wharf Precinct,” Mr Emerson said. Lord Mayor Graham Quirk said the release of the Draft Reference Design was a critical step in the planning process for the BaT Tunnel. “With the release of draft Reference Designs we are one step closer to delivering this world-class public transport project for Brisbane,” Cr Quirk said. Conceptual images have been released for the three new underground BaT stations for Woolloongabba, George Street (Queens Wharf) and Roma Street. It is not yet known if the new CBD station which is to be situated underneath 63 George Street on the corner of George and Mary street will be connected to the new Queens Wharf Integrated Resort via an underground passage like in many asian cities. The project is due to be completed in 2020 and operational in 2021. Detailed maps of the Draft Reference Design are available online at www.tmr.qld.gov.au/ubat and at upcoming community information sessions. I don’t understand why every tunnel rpoject has be bored. Can’t we just cut and cover along major roads to get more track? Like how most subways systems are built? It was how some were built in the past, today it is much more efficient to have a tunnel boring machine to cut the tunnel. In doing so you have a single continuous design for the tunnel that means all the internal fittings can be mass produced. It also means that there is little disruption on the surface so that the those above can carry on day to day without interruption and the economic impacts are minimised. It also makes it simpler to go underneath things such as rivers and major infrastructure. Theres underground services to be disrupted and rerouted with cut and cover (sewer, telecomunications, electricity, stormwater, gas). These can be tunneled under with boring (except for the station portals of course). Usually the bore ends are done with cut and cover or roadheader. I’m sorry, but i got stuck at the fact that out of 1000 entries, “BaT (Bus and Train)” tunnel was the BEST name that they had?